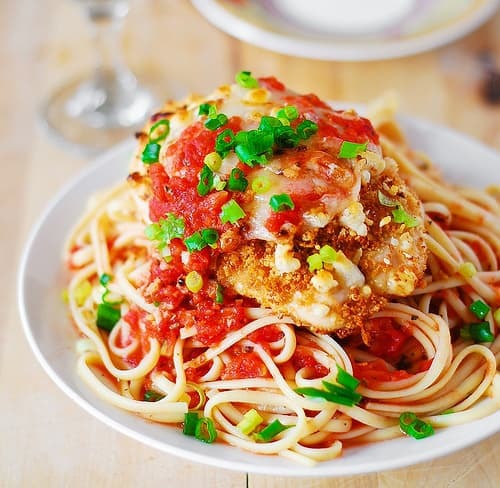 Chicken Parmesan Pasta with Garlic Tomato Basil Sauce – this recipe combines delicious Chicken Parmesan with linguine in marinara sauce. 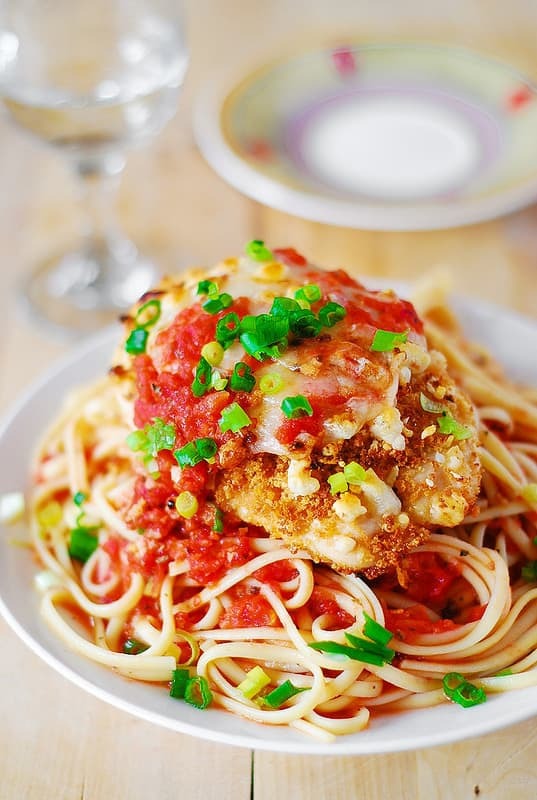 Chicken Parmesan is one of the best ways to prepare chicken breasts. In this recipe the chicken breasts are juicy, flavorful, and crunchy, and are made even better with a delicious garlic tomato basil sauce and pasta. 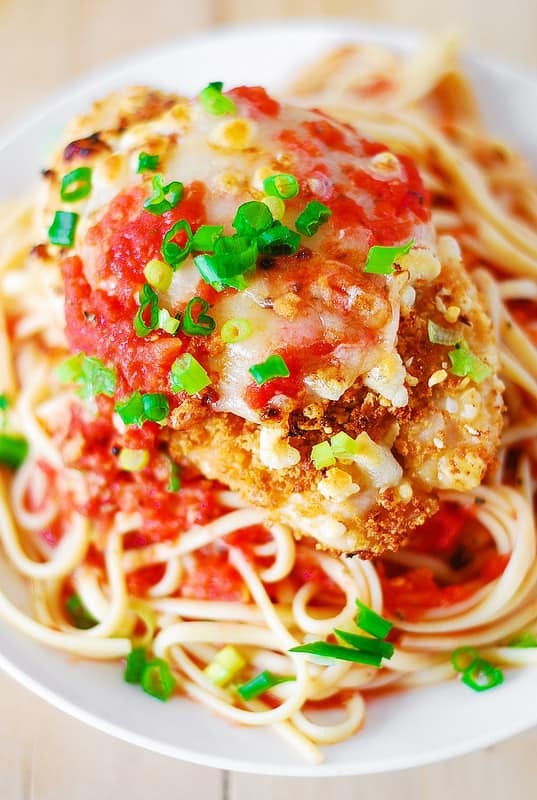 Chicken Parmesan is a surprisingly easy dish to prepare. The recipe below includes homemade garlic tomato sauce with basil (marinara) but you can use your favorite ready made jar of tomato sauce if you’re short on time. You can also add some minced garlic to the tomato sauce if you like. Baked Chicken Breasts nestled on top of pasta smothered in garlic tomato basil marinara sauce. Bake for about 20 or 30 minutes, until chicken bounces back when pressed, is no longer pink and juices run clear, and until cheese is melted. In the mean time, cook pasta according to the package instructions. Drain. Reserve about 1/3 cup of the sauce and set it aside (you'll use it to top the chicken) - keep it warm. Add pasta to the cooking pan with the remaining sauce - keep it warm while you prepare chicken. Place 1/4th of pasta (mixed with tomato sauce) onto each of 4 plates. Top each plate with chicken breast. Spoon a little bit of the remaining tomato sauce over the top of each chicken breast. Having never made this dish before, I must say I was terrified because chicken always seems to either be tender or SUPER DRY and tonight my chicken was tender, tasty and crunchy! Thank you! 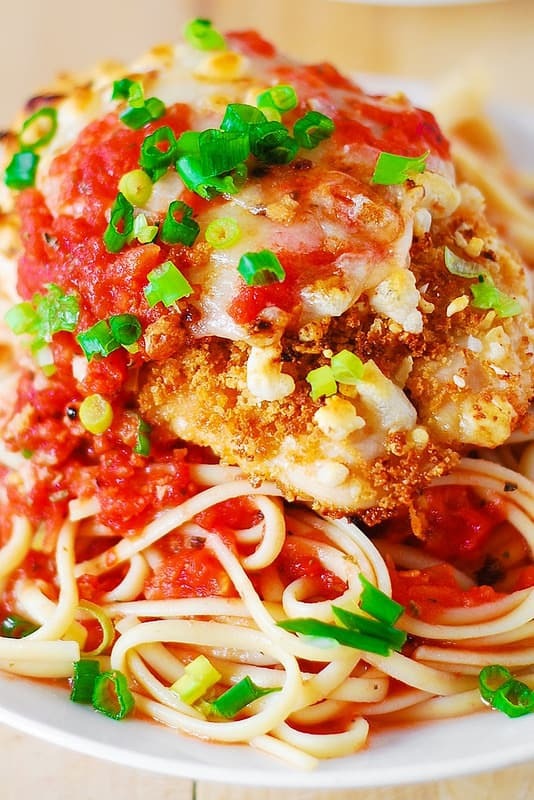 This is my favorite chicken Parmesan recipe! I’ve made it many times and always make sure to have leftovers. It tastes so gaurmet! The sauce is really amazing. This looks like the most perfect dinner ever! My mouth is watering right now! That’s certainly an interesting idea to have two great Italian dishes together. It looks very colourful and yummy.